We’re previewing each of these forces to give you a taste of what the book can do to transform your business. You can read about the first force, Focus on Your Whales, here. So you’ve figured out who your whales are and you have a handle on what they want and what you can offer them to fill that need. Now how do you monetize that information by turning them into paying customers? There are multiple factors at play here, but the deciding factor I discovered through my research was how effectively you communicate your value proposition. That is, who you are targeting, what problem you solve for them, and how. I’ve seen it myself a million times. And there has been endless research done that bears it out. Among websites with poor conversion rates, the most common detractor is having a lackluster or unclear value proposition. Don’t let your inability to properly communicate the value of your product be the reason potential customers pass you by. Furthermore, you have to bring this value proposition to life, not only in the words you use in your marketing copy, but also by letting prospects experience your product in a risk-free manner. To truly be conversion-oriented, you have to strike a deft balance. You need to give enough to your whales to adequately showcase your value proposition without giving everything away. Conversion is all about getting the customer to take the desired next step, whether that’s providing contact information, filling out a form, or making a purchase. It’s in this area where most content creators have the opportunity to improve. Under the current digital advertising model, publishers get paid every time someone clicks on anything. Therefore, site views are often the ultimate goal. Because of this, many sites are visually cluttered messes! Pop-ups on top of pop-ups and auto-playing videos send potential customers in random directions — or even running for the hills. This confusing aesthetic and misplaced focus on mere clicks won’t get you the conversion results you desire (especially in light of recent ad blocking changes). How Do You Actually Sell? You need to give a little to get something in return. Putting free, high-quality content in front of your paywall is key to catching the attention of your whales. Make sure it’s search-engine optimized and is representative of what they’ll actually get if they buy your product. Once you’ve shown them what you’re all about, you need to progress to opening up a channel of communication with them. You may need to get creative here, as a simple newsletter isn’t really sufficient to reel anyone in these days. Play with different options like a coupon code or a free download in exchange for their contact information. Rather than just telling your audience what your product can do for them, show them! By giving them a taste of what they can have if they commit to being a paying customer, you’re giving your value proposition some teeth and making it experiential for people. We explore various risk-free offers in this article. While you need to show, not tell, it can be a delicate balance. Effectively drawing customers in and then converting them properly is part art, part science. You want to give them enough milk to entice them without giving the cow away for free. Experiment to find what suits your business best. Keep an eye on your customer data and analyze it regularly. Test and retest to find that sweet spot for maximum conversion. If something isn’t working, find a way to tweak it. With time and observation, you’ll begin to see what kinds of content people are willing to pay for and you can more easily anticipate how to best organize your site. Many companies are leaving money on the table every day by failing to properly convert the audience they already have. Don’t be one of them; don’t let your whales get away! 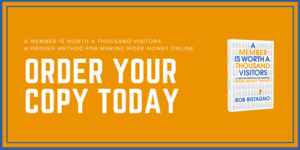 For more advice on how to create the perfect formula for online content monetization, order your copy of my book: A Member Is Worth a Thousand Visitors: A Proven Method For Making More Money Online.